I am super excited to announce a new feature to the blog. My dear friend Michaela is a professional organizer that has helped me declutter and make my space a better place to be. It is so freeing to let go of things that I realize have no personal value to me and makes even the simplest tasks easier. She’ll be joining us every Monday are sharing her tips for paring down and making your space beautiful. Be sure to check out her website at Simple Sweep for more great tips! Hi everyone. 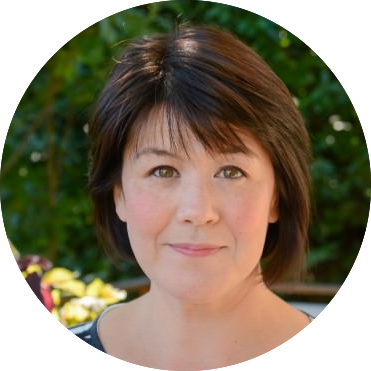 I am so honored to be here as a guest contributor to Tina’s beautiful blog. Like Tina, I am someone who believes that life is better with less stuff. As a professional organizer, I work with clients to pare down their material possessions in order to free them up to enjoy their lives. As a mother of three little kids, I am constantly trying to create easy ways for us to live better with less. Our house is pretty tiny so there’s not a lot of room for extra stuff. Each week on Scaling Back I will share with you some of my tips and tricks for getting organized and staying sane. This week I’m focusing on how to get your kids’ toys organized. Sometimes this can feel impossible but here are 5 easy ways to get you started. Pare Down: Go through your kids’ toys and see what they’re playing with and what they’re not. If you have younger kids that you want to keep some toys for, box those up for later and then make a box of toys to donate. You can do this with or without your kids. In an ideal world your kids will learn a valuable lesson about giving to those less fortunate. Don’t get frustrated if this doesn’t happen the first time around. Once they see how their life doesn’t fall apart with fewer toys, this exercise will get easier. Swap Out: If you have a lot of toys that you can’t seem to part with quite yet, try taking a 1/4 or even half of them and storing them away for three months. In three months time bring them back out and store something else. Rotating toys makes them seem new and exciting and doesn’t cost you a dime! Bundle Up: Put like toys together. 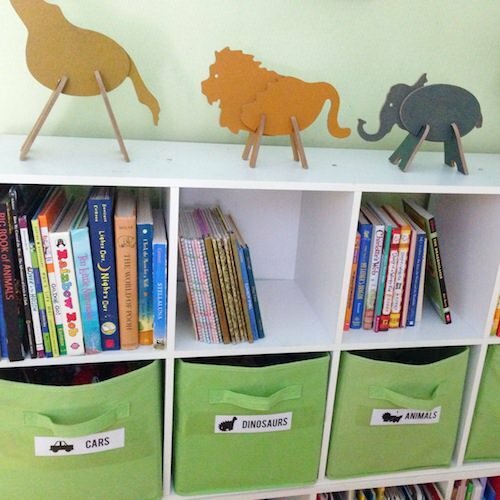 I love these smaller bins for storing toys. Cars in one, Legos in another … you get the idea. (If you have way more than can fit in this size bin, it may be time to week through and keep only the best stuff) This makes it easy for your kids to find what they are looking for and even easier for them to clean up. I am a big advocate for making clean up super easy for kids. This way they can scoop up all their cars and throw them in one bin. Done. Label: Put labels on the outside of all your bins. If your kids are small add a picture until they can read the words. I found these cute labels here. 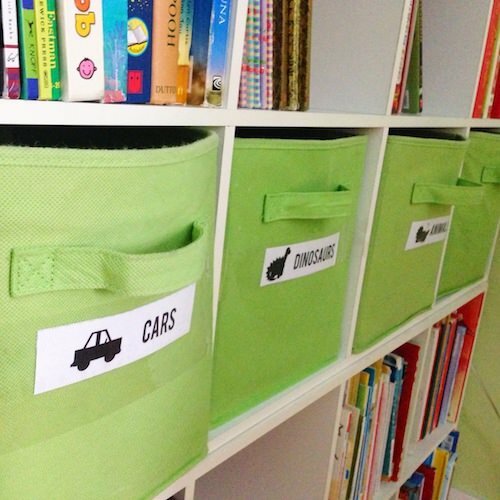 This helps your kids know where to find what they want and better yet, where to put it when they’re done. 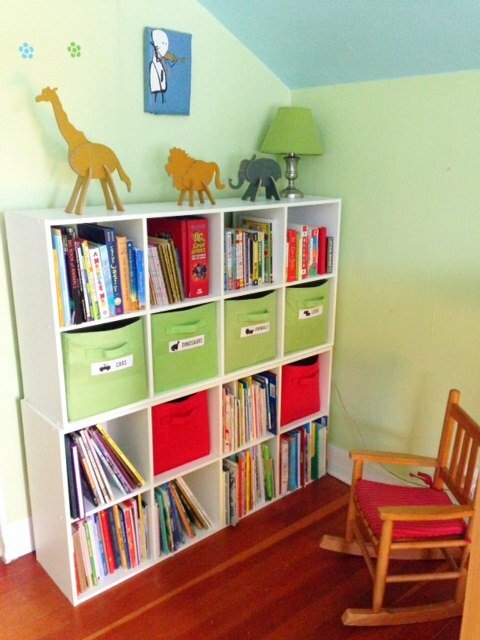 Give Them Space: Make sure to give your kids room to play. If their space is a cluttered mess it’s going to be hard for them to play and even harder to clean up. Make sure beds are made, clothes are off the floor and all their toys have a designated space. Kids are only going to be organized if we make it easy and enjoyable for them. So lead by example, don’t overwhelm them with choices and see what can happen!